upside down to watch the new concrete part of the Dew. The Dew Tour announced that, in an effort to enhance skateboarding for the 2011 season, all skate street courses will include concrete elements. The Dew Tour is in talks with renowned design and building groups to collaborate in this effort, including California Skateparks, a leader in developing high-quality, custom skateparks. The 2011 Dew Tour will kick off in Ocean City, Md., the tour’s first beach front event. The circuit will continue on to Portland, Ore. in August, Salt Lake City in September, and return to Las Vegas, Nev. for the Dew Tour Championships and Dew Cup awards ceremony in October. Each stop of the circuit will feature a different mix of disciplines and specialty competitions, exposing every market to fresh experiences. 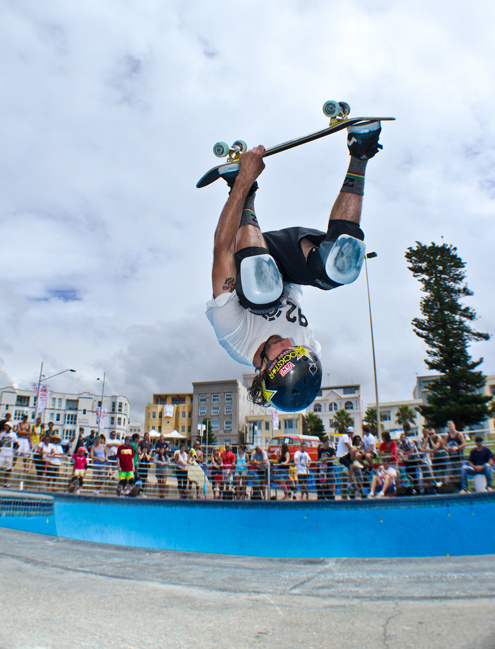 New for 2011, Ocean City and Portland will offer an additional skate bowl contest. Raising the stakes this year, the prize purse has increased per event along with the year-end bonuses. The full Dew Tour schedule features multi-sport events at each of the four stops, including skate street and vert. Over the course of the tour, athletes will compete to accumulate points based on their individual event finishes, each vying for the most overall points and the title of Dew Cup champion. The Dew Tour consists of four major, multi-sport events spanning across the country, with a cumulative points system, more than $2 million in event and bonus purses at year-end based on overall tour standings. The Tour features skateboarding (street and vert) and BMX (park, vert and dirt) along with skateboard bowl, surf and freestyle motocross. At season’s end, the overall points leaders in the five disciplines will be crowned year-end champions and awarded the prestigious Dew Cup. As part of an Alli property, key lifestyle elements complement the competitions at each Tour event including the Festival Village, specialty competitions, and live, cutting-edge music. The Dew Tour is broadcast live on NBC Sports with additional competition and lifestyle broadcasts on MTV, MTV2 and USA. The Dew Tour is also distributed on Fuel TV, Universal HD, and internationally on Eurosport, Fox Australia, Extreme Channel and Allarco Superchannel. The Dew Tour partners include Mountain Dew (tour title sponsor), Toyota, Nike 6.0, Ball Park, JC Penney, Paul Mitchell, PlayStation®, PowerBar and MyPlash. More information can be found at http://www.allisports.com/.